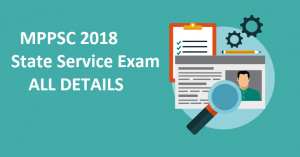 Check the latest MPPSC State Service Exam Notification 2018 from this post. MP Mains State Services Mains Online Form Application dates will end on 31st May 2018. At mppsc.nic.in,one can see the Madhya Pradesh SSE Mains application form official link. Total 202 candidates will get employment in various government posts in Madhya Pradesh state by this competitive exam. Latest Update (11th May 2018): MPPSC State Service Exam Notification 2018 for mains exam is released on 1st May 2018. Check the eligible candidates for mains exam. Check MPPSC State Service Mains Exam Notification 2018: Now the viewers of our site from Madhya Pradesh have been waiting for this state Service Mains exam announcement from a long period of time. At finally they have witnessed this MP SSE Notification which was made officially by the higher officials. This exam is one of the most prominent recruitment among all the competitive exams of Madhya Pradesh. The candidates who cracked this with a good result will get the posting as a higher official in one of the Madhya Pradesh Government departments. To do that achievement many candidates have been preparing in this mains exam very sincerely. All those serious individuals get ready to make all the arrangements to fill the Mains application form of MPPSC SSE 2018. Recruitmentindia.in will update you daily about the upcoming or latest all states Sarkari jobs. Fill MPPSC SSE Mains Online Application Form: The designation of the board that looks after the role of recruitments of Government jobs in Madhya Pradesh state is called Madhya Pradesh Public Service Commission. The complete responsibility related to Madhya Pradesh government Jobs will take care by this MPSC board. Definitely this issuing of MP SSE 2018 Mains notification at this moment is a very great chance because the applicants have two months time for the preparation to appear for the exam. That means two months before the exam date, the notification was released giving a lot of time for the applicants to improvise their scores in the exam. For this exam, you have to start the preparation at least six months before the notification as if you are quick learner. Then only you can attain your name in the State service exam mains qualified candidates list. Post Name: State Administrative Service , Naib Tahsildar, And Many more. The complete qualifications for MPPSC State Service Exam Notification 2018 notification as per the job wise. To fill the application for this notification, the individual should finish graduation/ Degree from a recognized university. Must be qualified in MPPSC Prelims State Service Exam. Candidates, age must be as per the MPPSC State Service Exam Notification rules. Application form filling candidates must pay non-refundable fees as category-wise. It is good if you check it in the notification which is given below. MPPSC board offers a monthly salary of Rs. 15,600/- 39,100/-, Rs. 9300/- 34800/- and Rs. 5200/- 20200/- with different pay grade. MPPSC Mains State Service online Form @www.mppsc.nic.in: The jobs that comes under the category of MPPSC State Service Jobs are Deputy District President,Transportation Sub Inspector, Naib Tehsildar etc. The full job profiles are updated in the above table.You can check it there easily. All the above mentioned jobs will be recruited under this Madhya Pradesh State Service Exam 2018.The jobs that will be recruited by this MPPSC SSE are highly responsible and high cadre jobs in the respective sarkari departments. Complete analysis of this recruitment is made by us to give the clarified information about this advertisement. All the graduation completed candidates in any discipline are eligible for this MPPSC State Service Exam Notification for Mains Exam with respect to the educational qualification wise only. Other remaining eligibility norms also has to be known by the contender by seeing this post. The duration period of application filling is only 20 days that is upto 31st May 2018. So speed to submit the MPPSC SSE Mains Online application form from the official recruitment web page related to this recruitment. Get the pdf of the syllabus through our page.